This film is about an Indian hero, a Native American leader and chief. 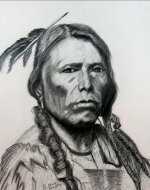 His name is Crazy Horse; he is honored by his people and tribal members as a brave warrior. In his early age, he presented his excellent abilities that he kills a buffalo. When he was 16 years old, he was named by Crazy Horse which was his father's name. Then, he became an Oglala Lakota leader. In this film, he fights with the US Federal government which invades their territories and wants to explore gold from this soil. As a tribal chief, he took up arms against the invaders and wins a lot of campaigns. At this time, he received a lot of respect and support however, a fellow tribal person, Red Cloud became jealous. Red Cloud framed Crazy Horse. On the morning of September 5, 1877, Crazy Horse was arrested and killed outside the adjutant's office. This film is taken from a tv broadcast so you may notice some onscreen messages.